The IAACE and Indiana Literacy Association Adult Learner of the year award goes to THELMA BENNINGTON. Thelma was a high school graduate with a third-grade reading level, when she came to The Literacy Center in January of 2006 with a goal to improve her reading and technology skills because she didn’t want to be embarrassed about her reading inadequacies any longer. She has determinedly stuck with the program for 11 years and worked with more than one tutor. Although Thelma faced struggles and plateaus in her journey, she amassed 275 instructional hours in 2014 while completing seven novels. In 2015, Thelma read ten novels and had over 90 hours. In 2016, Thelma completed 86 instructional hours and read eleven novels. Despite full-time employment with constantly changing overtime and shift changes, she has puts in the hours on a regular basis, month after month, and year after year. Over the last 11 years Thelma developed an excellent pattern of reading and raised her reading skills from a third-grade level to mastering the READ assessment and obtaining seven level gains. As a devoted learner, she continues to work diligently to accomplish her goals, her goals accomplished include: spelling; online banking and budgeting; geography and map reading; navigating the internet, embracing e-mail, downloading electronic books, reading from and utilizing tablets, navigating with GPS devices, and communicating via Skype. She has also shown bravery, traveling by car to St. Louis, Missouri; and Clarksville, Tennessee. And traveled solo by airplane to Dallas, Texas, with a connection in Atlanta. Thelma’s dedication and progress are admirable. She exemplifies fortitude, attitude, adaptability, punctuality, consistency, bravery, and goal achievement. Thelma has successfully surpassed her goals. She has continued her path of being a self-directed engaged learner by starting her seventh novel this month. Thelma is anything but embarrassed today: she now proudly reads aloud, welcomes book recommendations from friends, and impresses her tutor with her insight when they discuss complex themes and characters. 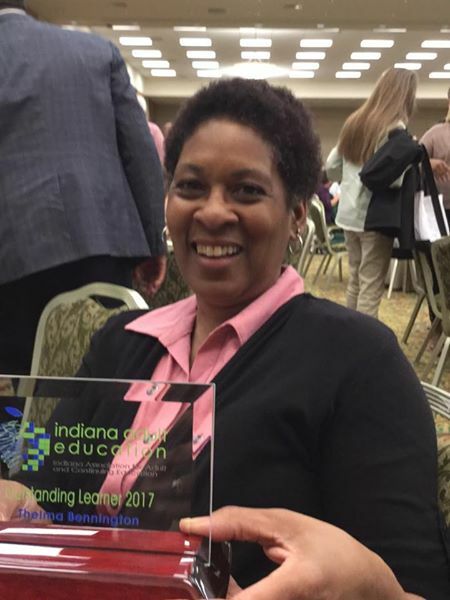 The Literacy Center is very proud of Thelma Bennington the 2017 IAACE Outstanding Learner of the Year.